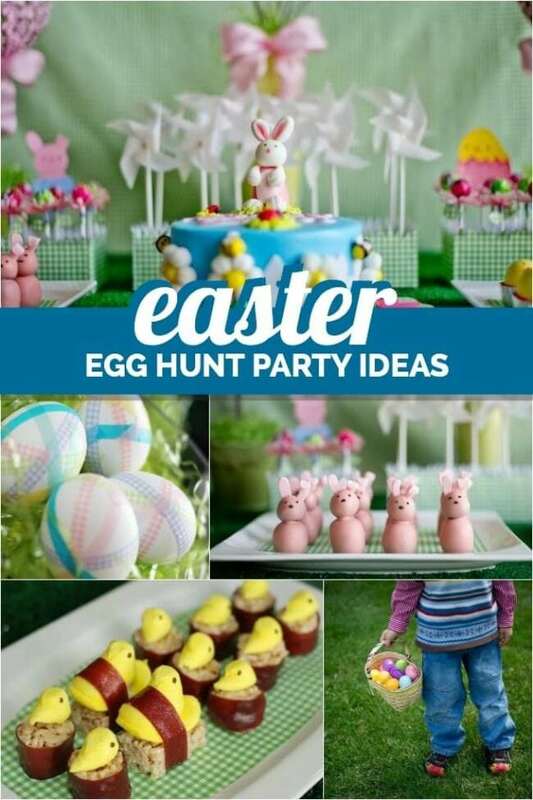 Need inspiration ideas for a darling Easter egg hunt? Here you go! Christine, of Pure Joy Events, created a delightful dessert table full of spring colored decorations and treats that would console even the child who didn’t find any hidden eggs! Stuff their eggs with great trinkets and toys and more great ideas found in this list of 40 Things to Put Inside Easter Eggs. Want to limit their candy this Easter? Check out these 50 Easter Basket Treats That Aren’t Candy. I love the small details of this Easter display—what visual enchantment! I especially appreciate that although there is a lot of pink used on the table, the green gingham and faux grass table covering grounds it and keeps the color from alienating the boys in the room. Gingham is such a light-hearted pattern and using a length of the fabric is a simple solution for a temporary dessert table backdrop. A coordinating centerpiece bouquet (a bare tree branch with tiny paper flowers glued on) is flanked by twin topiaries planted in green painted pails. Those topiaries are easy to make, too, if you’d like to try it. Stick a painted, or ribbon-covered, wooden dowel into a Styrofoam ball. Use a paper punch to make mini-flowers and use seed-head pins as centers that secure the flowers to the ball. “Plant” the finished ball in another piece of Styrofoam inside the pail. A jaunty bow finishes the arrangement. Pinwheels are also easy to make and you can choose your own colors. These look sweet as table décor plus they’re another pleasant diversion for busy little ones. The fun garden of edible flowers is made with paper flower petals, ribbon leaves and lollipop centers. Every child would love to pick a bouquet of those! Notice how the pinwheels and lollipops are displayed in gingham rectangles. Achieve this look by using blocks of fabric-covered Styrofoam. I love how Christine snipped the edges to look like fanciful blades of grass. Paper bunnies and eggs are tucked into these displays, too. Honey bees and ladybugs join a little rabbit on the flower garden cake. Isn’t the floral shaped cake plate the perfect presentation? Our easy bunny cake would also look good on this table! Add a colorful detail to the display by covering eggs in spring-hued washi tape and present them in an elevated grass nest, under glass. Square, white platters, topped with coordinating green gingham papers, are a wonderful way to serve the cutest treats. Little yellow chicks in paper foil nests, a warren of pink rabbit candies, theme-shaped cookies, and my favorite, sushi peeps, would satisfy any sweet tooth. 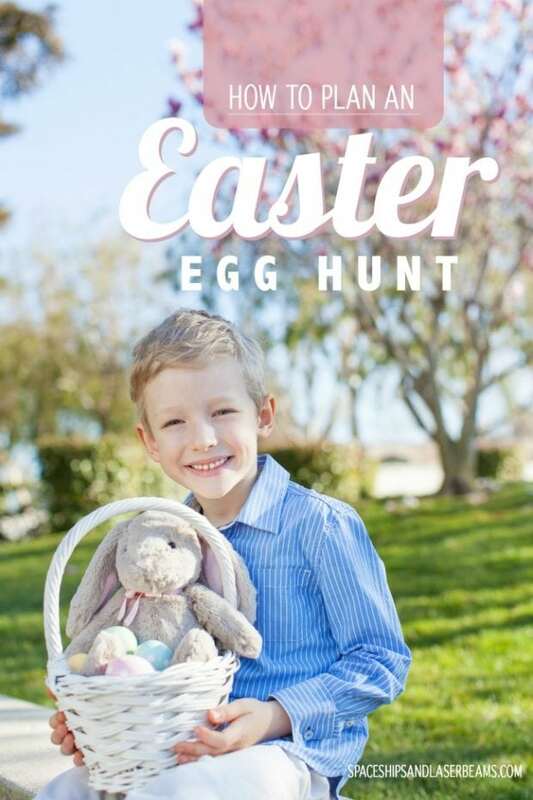 After enjoying a pleasant Easter themed table full of treats, finding colorful plastic eggs is double fun for kids, especially when they’re filled with trinkets and small surprises.